Ciudad Oaxaca (Oaxaca City), March, 2018. This is where I want to be. After spending a week visiting friends in a Mexican resort town I’m eager for a more genuine Mexican experience. I don’t have a lot of experience as a street photographer. I live in a somewhat cold northern city, Calgary, Canada, where people largely live indoors and the downtown core is mostly deserted outside of working hours. In winter it’s especially desolate and I also tend to spend a lot of time at home. 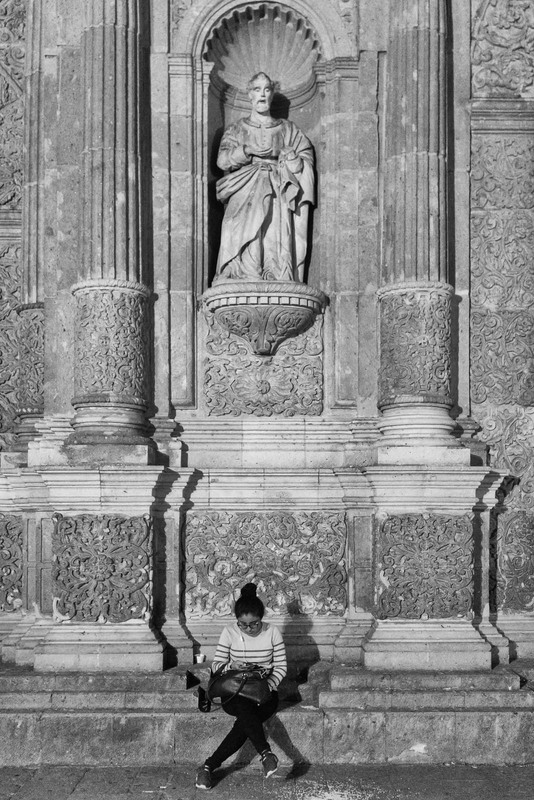 If I want to improve my confidence and street photography skills, Oaxaca City is a better place than most to practice. So, following a 10 hour bus ride from Hualtuco, here I am in a vibrant and very Mexican city. One of the first things that strikes me is that there aren’t a lot of tourists like most other places I have visited in Mexico. It turns out that there are plenty of tourists, but many of them are from Mexico city. So I’m delighted to find myself surrounded by Mexicans, who seem to be the friendliest and happiest people on my home planet. 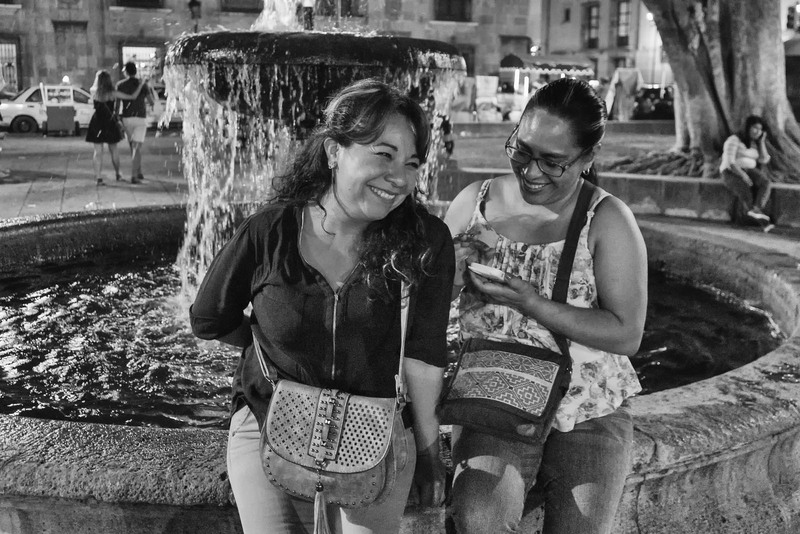 Every Mexican town and city has a central plaza, usually right in front of the Cathedral and Cuidad Oaxaca is no exception. The plaza is usually the liveliest place in town. Mexicans live outdoors a lot. In Oaxaca the Plaza de la Constitución is commonly called the Zócalo and I know where I want to spend most of my time. My wife and I find a hotel that’s a comfortable 4 block walk from the Zócalo and we don’t spend a lot of time there before heading out. 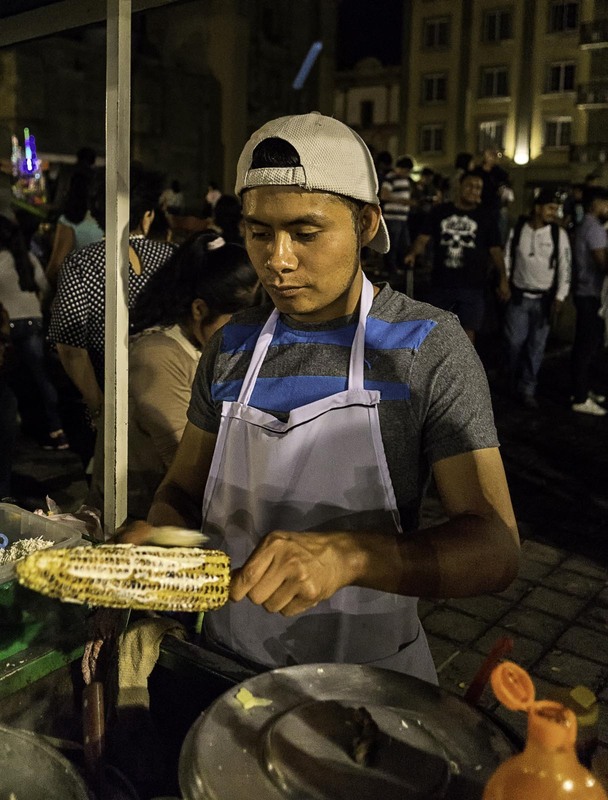 We spend the afternoon getting familiar with the Zócalo and the surrounding area, finding where good coffee can be had and discovering a surprising lack of taco stands. Tacos are a mainstay of my diet when in Mexico, but in Oaxaqueños eat tlayudas. A Tlayudas Re is similar to tacos, but the tortillas are not folded, they’re crisp and they’re layered like a sandwich. A tlayuda is a pretty good alternative to a taco. 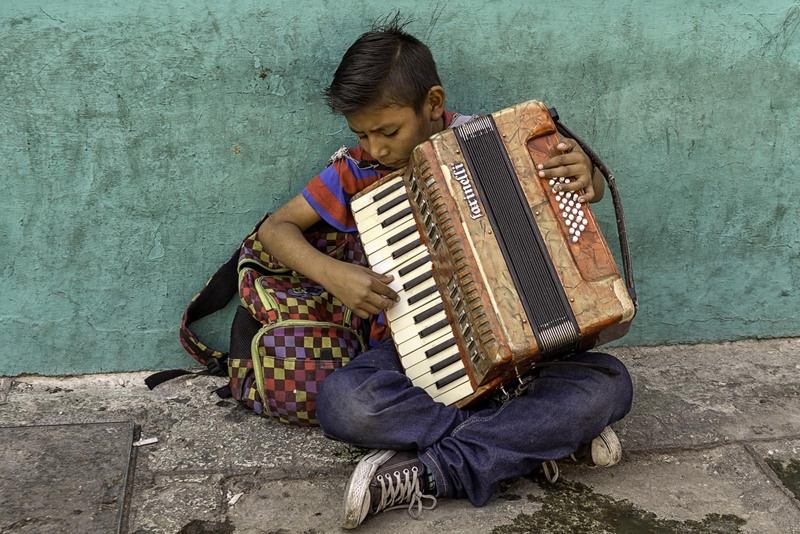 Like most places I visited in Mexico, Oaxaca City provides bright sunshine and lots of colour during the day and I find a few interesting subjects like this young busker playing the accordion, but I know that the Zócalo will really come to life when the sun goes down. 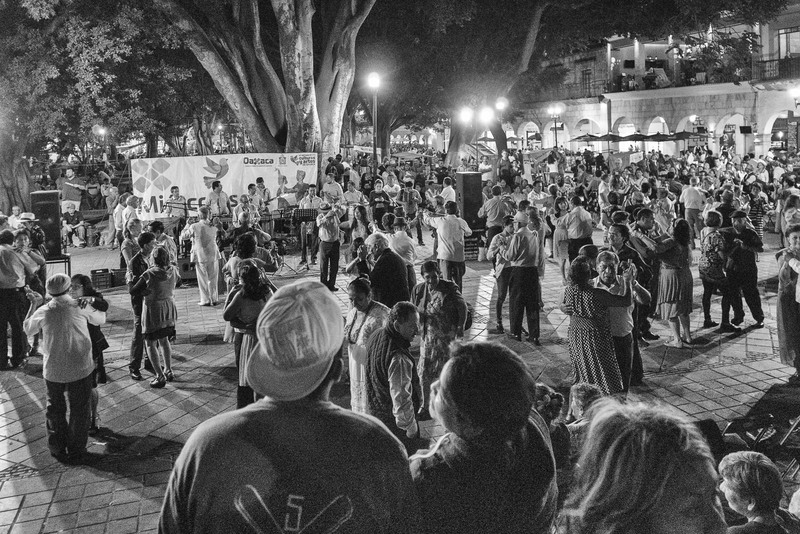 The temperature cools down and people love to enjoy the plaza in the pleasant warmth of the evening. There are a number of younger buskers in Oaxaca. I have a simple practice when it come to street performers. If you listen (or watch) you pay. If you pay you also do them the courtesy of listening. Because of the heat the performers are usually found on the shady side of the street. While I like to support the performers with a donation most of the time, I eventually run out of change. I find that walking on the sunny side in the heat is the price you pay instead. Our first evening in Oaxaca does not disappoint. The temperature is comfortable and the Zócalo is indeed the place to be. My Sony a6000, while not the best low light camera I own, is my favourite travel camera because of it’s relatively small size. 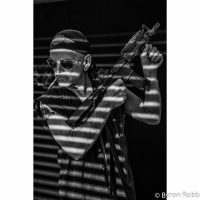 A Sigma F2.8 19 mm prime gives me enough light and makes me get close. A slow walk around gives me the overview and a chance to decide which outdoor food vendor will be my dinner provider. There are a number of enticing options including the familiar hamburgers and hotdogs, but sill no tacos. My wife Heather opts for corn on the cob and when I see how they prepare it I can’t resist either. Roasted over charcoal, slathered with cream cheese, a sprinkle of chili powder and a dash of hot sauce for the brave. Count me in. I’m still a bit tentative about photographing strangers from close range. So far I’ve mostly photographed buskers and food vendors who are used to being photographed and whose livelihoods partly depend on it. There are a number of people sitting in front of the cathedral and I decide that this might be a way to break the ice. I keep my distance, partly because the cathedral is also a player in the scene. While many people chat with their friends this young lady was catching up on her social contact electronically under the watchful eye of a saint that I have not been able to identify. Every night there is dancing. Some nights it’s the general public, but on this night it appears to be a dance troupe. 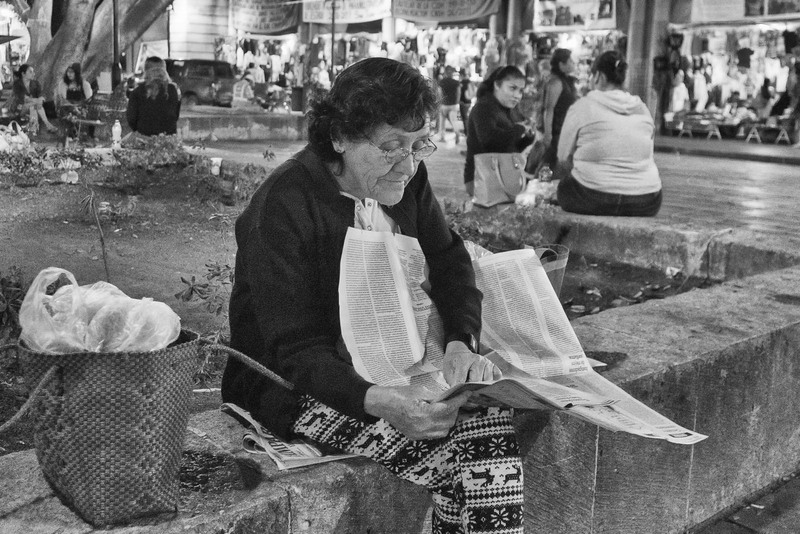 Of course, it’s easy to photograph those that expect to be photographed, but now it’s time for me to put on my big boy pants and try some real street photography. Some are here to socialize, but this woman is here to catch up on the news. She looks reasonably harmless and, in fact, completely ignores me while make this shot and then go to her other side for another. She may be used to tourists with cameras or the news is really compelling. Doesn’t matter. I have my shot and a shot of confidence. 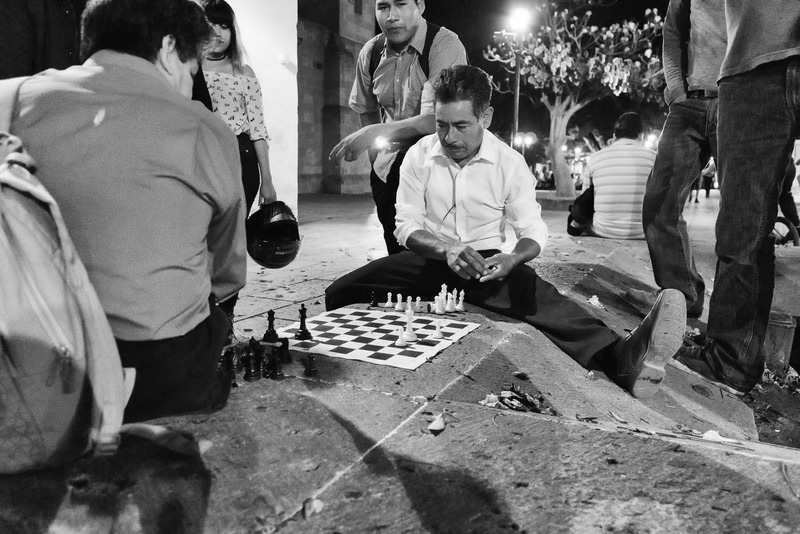 Next I come across these chess players. They play so fast that I get caught up in watching them and almost forget why I’m here. They literally don’t take any time between moves. At this point there are only 5 pieces left on the board and although I wasn’t there for the start of the game I’ve watched for less that two minutes and seen them devastate the battlefield in no time flat. I realize I have to take my photo now or I may miss the opportunity. Only an onlooker is aware of my presence. Like any well attended public event, and an evening at the Zócalo has the feel of an event, there are loads of people taking pictures with cell phones. Out of the corner of my eye I spot one pointed in my direction. I’m quite pleased and not terribly surprised that someone would photograph me here. Not surprised because I’m one of only a few people that are obviously not Mexican. With a disarming smiIe I walk over to the photographer and ask her if she took my picture. She denies doing it, but her friend says, yes, she did. They speak English so I tell her that it’s perfectly ok that she did and it actually pleases me. She doesn’t want me to see the picture, but agrees that it’s fair that I take a picture of her in return. Satisfied with my night’s work I start the walk back to the hotel and come across this absolutely compelling scene. This young entrepreneur had a few of his drawings pinned to the street with rocks and was either selling them or looking for donations. I don’t know how he got the cake. Maybe a donation because there are a 6 and a 1 lying on the plate and he’s certainly not 16. 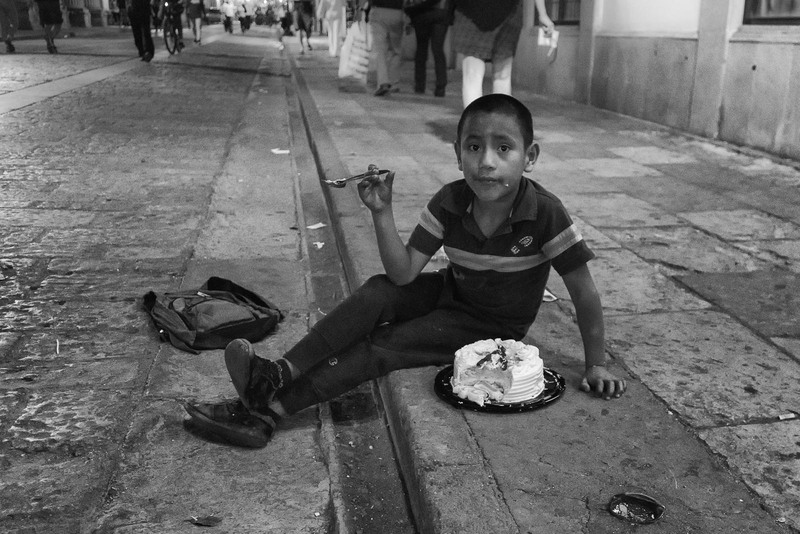 I can’t help but think of how he is just old enough to be out at night on his own trying to earn some money, but still just a kid that will probably eat as much of the cake as he can. My visit to Oaxaca City will end soon and I’ll be back in the cold dark north long before outdoorseason begins in Calgary. But I am returning with the most important tool a street photographer can acquire: confidence. I am eager for people to start spending time outside. I live in Calgary, Alberta, Canada and did not pick up a camera in any serious way until I was in my 50s, about 10 years ago. I was spending the winter in Puerto Vallarta and I wanted something to keep me occupied other than drinking beer on the beach all day. So I bought a Canon Rebel and made a point of making at least one photograph a day. I soon discovered that I loved photography and was not too bad at it. I liked making vacation photographs, especially those that included locals. This, of course, led to an interest in street photography, but it was a long time until I decided to get somewhat serious about it. I am strictly an amateur with no ambition to turn my avocation into a vocation, but I do like to have people see my work occasionally.